Young bus drivers put their driving skills to the test this week with the Scania Driver Competition held in Queensland. Jola Ramsay of Sid Fogg’s Coaches, New South Wales, was named Bus Driver of the Year and received $10,000 worth of prizes. 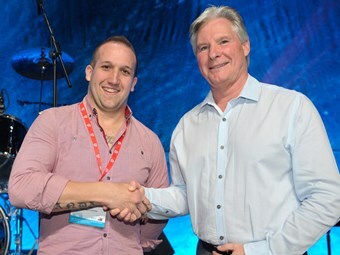 Runner up was Nigel Chater, of Cranbourne Transit, Victoria, and Carl Searle, of Hannfords Bus Service, New South Wales was awarded third place out of the 12 competitors. The awards were presented at the Scania-sponsored dinner at the Australasia Bus & Coach Conference & Expo on September 30. The joint Bus Industry Confederation (BIC) and Queensland Bus Industry Council (QBIC) event was held over three days at the Gold Coast Convention and Exhibition Centre, Queensland. The driver competition consisted of three components – a practical driving test, a theory test and a mock media interview. Conference delegates were bussed out to the Gold Coast Race Course to witness the skill involved with the practical component of the competition. Public Relations Manager Alexander Corne says the competition is about increasing awareness of young drivers in the industry so people can understand the viability and excitement of a career in bus driving. "What this year’s crop of finalists has shown is there is a very high degree of passion for the profession among younger drivers which has been really good to see," he says. "The bus industry as a whole should be proud of these 12 people." Ramsay accepted his award on stage in front of the hundreds of delegates attending the dinner. This was the third time he had entered a Scania driver competition – once as a truck driver – and was pleased to finally take out the title. "It’s been a good competition," he says. Ramsay entered the competition to test his own skill and also to help boost the profile of bus driving as a career. "I love coaches and I love the interaction with the customers," he says. "I thought it would be a really good challenge."